Many inquire about the background music used on the Chaplet of Mercy with Music. Here it is! Composed, recorded and produced by Fr. Jim McKearney who has graciously expressed that his music be shared freely for the glory of God. As per Fr. Jim’s wishes, permission granted to download, copy, share, play at your events, and use in your projects. Thank you Fr. Jim! 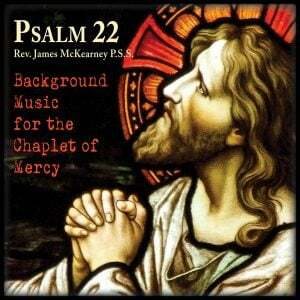 Download this recording at divinemercyforamerica.org/psalm-22-chaplet-background. Also available on SoundCloud, search for “Psalm 22 Chaplet Background”. As founders and directors of Mother of Mercy Messengers, an apostolate of the Marian Fathers of the Immaculate Conception, Dave and Joan Maroney have taken the message emanating from the National Shrine of The Divine Mercy in Stockbridge, Massachusetts to parishes, schools, and conferences across the United States and beyond since 1999. Visit the Audio Library at divinemercyforamerica.org/audio-library for other great recordings.